By profession, I am a trainer. I have a wide range of background experience but people development (and managing people development) is where my heart and skill lies. When Tawn’s boss found this out, I was invited to join part of their team for a weekend training session in Hua Hin. Their industry is Public Relations, their training was about creating client value, and they needed someone to play the role of a prospective client for some of the training exercises. 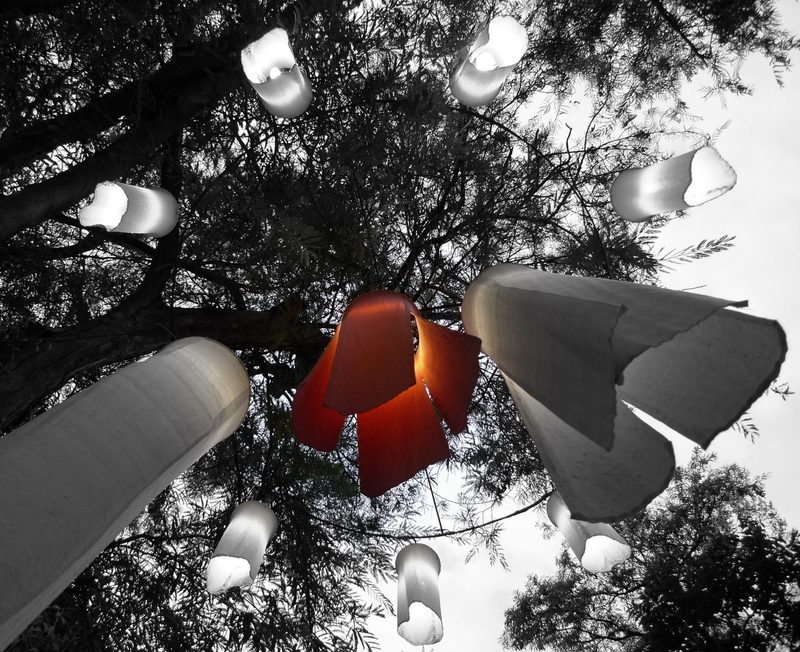 Glowing lanterns (in a vaguely northern Thai style) in the early evening. Hua Hin is a popular beach resort about a three-hour drive southwest of Krungthep (Bangkok). It is the home of His Majesty the King’s beach palace and so is a much cleaner and more desirable place than, say, Pattaya. In the past few years Hua Hin has also become much too popular and is now overgrown with high end hotels and fancy resorts. In other words, it has gone upscale and lost the inexpensiveness and carefree charm that made it a fun getaway spot for locals. Still, it retains its good weather, nice ambience, lovely beach, and tasty seafood. So who was I to refuse an all expenses paid two night trip to a beach resort there? Beach, pool area, and the restored 90-year old teak house, right. I’ll write more about the food in the coming days, but let me share some pictures of the resort. The resort, called Baan Talay Dao (“Home of the Sea and Stars”) centers around an authentic 90-year old teak wood house in which the training was held. It is a smaller resort, family owned and operated, and has probably been in operation for years and years. With the sprucing up of the rest of Hua Hin, it looks like they made a lot of effort sometime in the past few years to freshen up the resort’s facade and it now has a “boutique” look and feel. 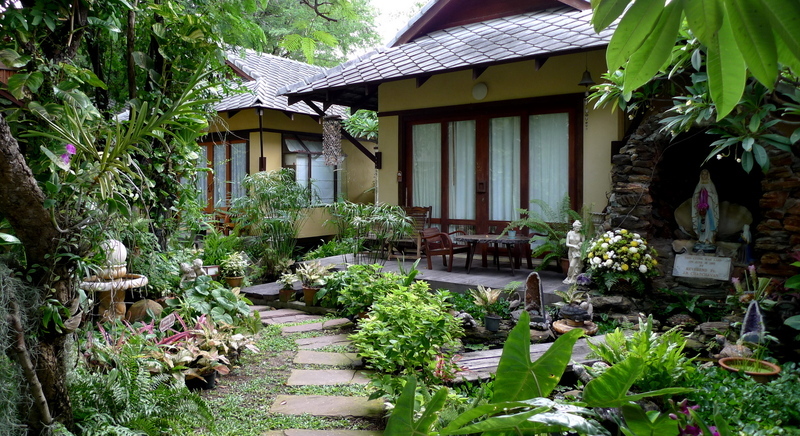 Private villas – note the grotto with the Virgin Mary in it, which you don’t see all that often here in Thailand! The property includes a combination of town-house style two-story buildings along with individual villas closer to the beach. The buildings are well-maintained and the landscaping is very lush. Inside the rooms, though, you can see the age of the facility. Not because things aren’t well maintained – they are – but simply because of the amenities offered and the roughness of the construction. I’ve seen this a lot in these boutique resorts in Thailand and that is why the price is $50-150 less a night than, say, the Intercontinental, the Sheraton, or the Marriott. 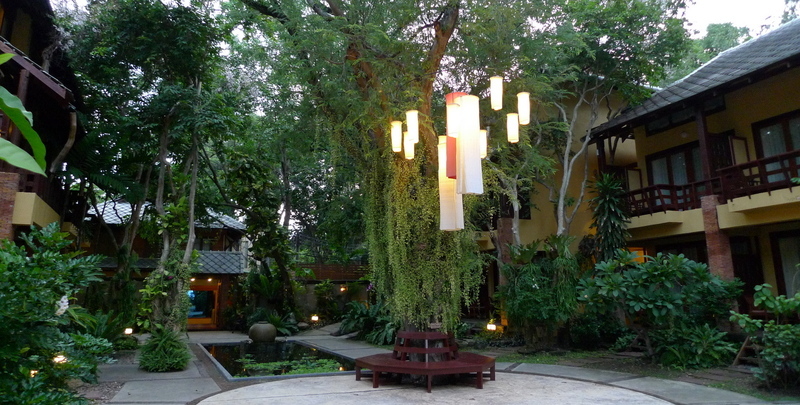 The townhouse section of the resort faces a reflecting fish pond and some beautiful trees. There is a full-service restaurant downstairs from the teak house and you can either sit in the shade underneath or out in the open air overlooking the beach. Their breakfast buffet is pretty impressive for a small resort and the dinner I ate the first night – a curried seafood dish called hor mok talay – was one of the best things I’ve eaten this month. Hua Hin is on the western side of the Gulf of Thailand hidden against a ridge of mountains on the narrow isthmus that is shared between Thailand and Myanmar. The benefit of this ridge of mountains is that the frightening storm clouds that blow over them tend not to drop their rain on Hua Hin, instead continuing up the Gulf and gathering more force before dropping their rain closer to Krungthep. This made for some very pleasant (and pleasantly breezy) late afternoons and early evenings as I enjoyed the relatively cool temperatures and watched the clouds, excpecting them to let fat drops of rain fall on me in response. Thankfully, this didn’t happen. The two days of training were pleasant. I had met most of Tawn’s colleagues on several occassions before (he wasn’t at the training, though) and so it was a pleasure to spend more time with them. Not only did I learn a lot about the PR industry, which was fascinating, but I discovered that as a group they are the biggest foodies (sea-foodies, to be precise) I’ve met in Thailand, which is why I’ll write about the food in a later entry. This entry was posted in Uncategorized and tagged Baan Talay Dao, Beach, Boutique, ChaAm, Hua Hin, Resort, Thailand, travel by christao408. Bookmark the permalink. Beautiful. We almost accepted a job there. that looks like a great resort to stay at; i can’t wait to hear about the food! I’m in love with those lanterns. What a lovely place and those garden pics are amazing – it’s almost magical there,I’d never want to leave ! Seems like you enjoyed that, and look forward to the foodie blog. It seems Tawn missed out this time for the food and the resort loction. It can be a nice escape from the bikes and cars of Bangkok, hehe. O wow that is awesome. Looking forward to the food stuff too. I felt a sense of serenity, just looking at these pictures, Chris. Thank you for posting them. I am happy that you were able to get away and enjoy the PR training sessions with others. The resort looks so peaceful! It would be a nice place to get away I suppose. I love the first snap- very beautiful! @AppsScraps – Well, you could always cultivate it, I suppose… but it is alright if you don’t have it. @Dezinerdreams – Thanks. When I saw the lanterns while it was still daylight, I started forming that picture in my mind. Glad it turned out nicely. @murisopsis – Well, Hua Hin isn’t quite at the point where you’ll mistake your view for LA or Chicago, but I get your point. Ha ha…@ZSA_MD – @Umnenga – @Chatamanda – Zakiah really captured it perfectly when she described the atmosphere as “serene”. It helped that there weren’t too many guests. @yang1815 – When you and Sugi come visit, we can add this to the “go-to” list. @stevew918 – Tawn enjoyed a couple of days of quiet and peace at home, being able to enjoy his own schedule. @TheCheshireGrins – They are neat, aren’t they? Some people feel they look at bit spooky at night, like spirits floating in the tree branches. @amygwen – Really? Do tell. @Sinful_Sundae – @kunhuo42 – Food entry is coming shortly. I need to run a few pictures by Tawn to confirm what things are called. @christao408 – Boy the list keeps growing!!! Love the pictures… So that’s what you do in real life. I thought you just cooked, cycled, take pictures, travel, blog and make wonderful travelogues. But seriously, you’re a good coach – I see it in a lot of your comments. @ElusiveWords – That is what I do in real life, although these days it isn’t about conducting training classes. Instead, I build the overarching training and development strategy and then create the training materials. Other people in the organization deliver the training. Thank you for your nice comment; I’d like to think that I have some positive impact as a coach and teacher in this life.